At a recent Cork City Council meeting, it was decided that a monument should be erected in Cork, on Penrose Quay to almost the one million people who emigrated on the five ships that bore the name “Innisfallen,” (better know in Cork as D’Innis) who were run by the City of Cork S.P. Co and B&I Line. 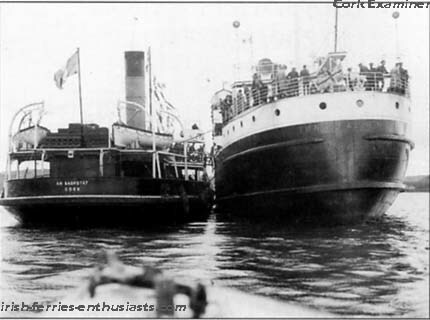 The first Innisfallen (1,400 gross tons) was built in 1896 and served with the City of Cork Steam Packet Company until she became a war causality in 1918. She was built at Newcastle and measured 272 feet long. She served on the Cork Fishguard route. 1936 but Coast lines (who were anything but neutral) switched the ship to Dublin Liverpool and on December 21st 1940, tragedy again struck. While outbound from Liverpool she struck a magnetic mine off Wirral shore near New Brighton and went down with the loss of 4 lives. Fortunately no passengers were killed and all 157 and the rest of the crew were rescued. with returns from Fishguard on Tuesdays, Thursdays and Saturdays. The ship layed over during the day at Penrose Quay, Cork and Fishguard putting to sea at night. She carried livestock and general cargo in addition to her passengers. In 1953 Coast Lines again decide to change ownership, and D’Innis transferred to City of Cork Steam Packed Co. She was repainted with a black hull, white superstructure and funnel with black top and she kept the service going until 1967. In 1967, B&I announced that new car ferries were on their way to Cork, and their 3 post-war ships would be disposed of. 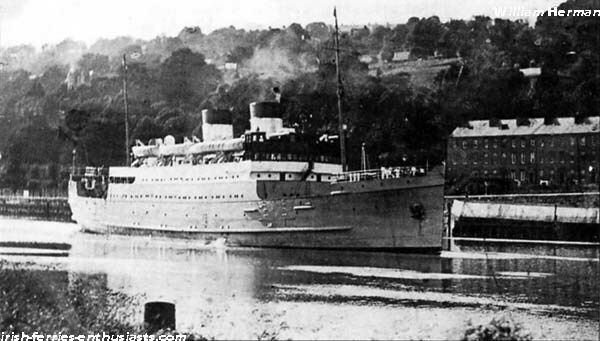 A new Innisfallen was ordered in Germany and would be a sister to the new Leinster (that was being built at Cork), but more changes came when British Rail gave notice of termination of agreement that allowed Cork ships use Fishguard. Now, B&I proposed a new ferry service to Swansea from Cork. In 1967 the old Innisfallen was sold to Greek interests and, since Penrose Quay was in the city centre and unsuitable for a ferry terminal Cork Harbour Commissioners developed new facilities at Tivoli. Meanwhile over in Wales a link span was built at the mouth of the River Tawe. 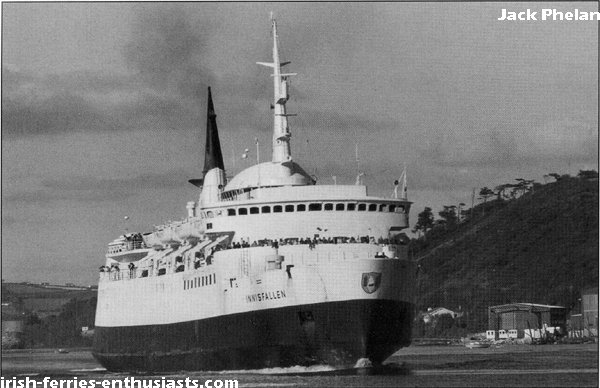 The new Innisfallen made her maiden voyage in 1969 and changed the service. Daily sailings, seven days each week replaced the old leisurely ways. There were fast trains running from Swansea and motorists could now drive straight off on arrival. The fourth Innisfallen (4,848 gross tons) brought a new class to the Southern corridor; clean, fast, classless and with a service speed of 24.5knots was the fastest ferry in the world when she entered service. Her speed was specified to enable the ferry return journey every day and still allow significant time for her to turn around in port. But the good times were coming to an end. 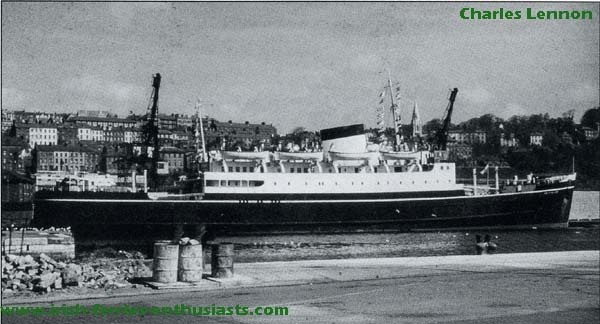 In 1979 Innisfallen was moved to Dublin, but growing unrest in the North resulted in a massive falloff of passengers and a year later she was sold to Corsica. B&I, like many other companies in the early eighties began to feel the economic pressures. They were forced to use one ship on Cork Pembroke and Rosslare Pembroke. The Leinster was renamed Innisfallen and became the fifth and last ship to carry the name. With her tight schedule and slower speed than her predecessor sailings were often cancelled (usually the Cork ones!) and on February 2nd, 1983 B&I closed their sailings from Cork, ending a service that traced its self back to 1882, and decided to concentrate on their shorter routes from Dublin. In November 1986 the fifth Innisfallen was sold to Strintzis Line after her final sailing from Rosslare to Fishguard. And so, Cork lost an old favourite, a name carried by five vessles was gone along with Cork’s link to the UK, which didnt reopen untill the councils in Cork and Swansea set up Swansea Cork Ferries, who operated the route until October 2006.